The piece that the windshield hinges on. You will have to drill all holes and cut tapers on ends. Closed car only. Steel Windshield Hinge set for the 1928-29. The piece that the windshield hinges on. You will have to drill all holes and cut tapers on ends. Closed car only. Steel Windshield Hinge set for the 1930-31. The piece that the windshield hinges on. You will have to drill all holes and cut tapers on ends. Closed car only. Glass bedding for the 1928-48 closed cars. 11 feet long roll of black 1mm flexible rubber that is used for setting the windshield glass in the fame. Coat with oil when installing, makes it slide in easier and will cause the rubber to swell for a tight fit. Windshield Bracket for the 1928-29 Model A Ford. An exact copy of the windshield bracket that was used on the closed cars for the swing arms to mount to. Rivets included. Made in USA. Windshield Bracket for the 1930-31 Model A. This is an an exact copy of the windshield bracket that was used on the closed cars for the swing arms to mount to. Rivets included. Sold each. Made in USA. An exact copy of the windshield bracket that was used on the slant windshield closed cars for the swing arms to mount to. Rivets included. Made in USA. 1928-29 Windsheild Header Screw Set consisting of six 10x1 round head wood screws, two 10x3/4 flat head wood screws and two 3"x1/4" carriage bolts. 1930-31 Windsheild Header Screw Set, consists of five 10x3/4 flat head wood screws to secure header panel to header. Windsheild header bracket screw set for the wooden header above the windscreen. This is a set of eight 5/16-18 x 2" flat head screws. Two screws go forward into the header and two at a right angle into the wood side rail. Also six 12/24 x 5/8 flat head screws and six 1/4 external, counter sunk lock washers to mount the brace to the vetical top. 1928-29 Windsheild Hinge to Header Screw Set. The 1928-1929 uses six 1/4-20 x 1/2 round head screws, lock washers and nuts. Stainless Windsheild Frame Screws for the closed cars. When dismantling the windshield frame to replace glass, these screws should be replaced. Four screws and two screws with nuts. Windsheild Frame Screws for the closed cars. Plain Steel Windshield Garnish set for the 1928-29 Coupe & Tudor. This is the garnish moulding that screws to the windshield post. Plain Steel Windshield Garnish set for the 1930-31 Coupe, Tudor and Pickup. This is the garnish moulding that screws to the windshield posts of closed cars. Goes on left and right of windshield opening. Stainless Steel Windshield Garnish set for the 1930-31 Coupe, Tudor and Pickup. This is the garnish moulding that screws to the windshield posts of closed cars. Goes on left and right of windshield opening. Plain Steel Windshield Garnish set for the 1931 Slant Windsheild Model A. This is the garnish moulding that screws to the windshield posts of closed cars. Goes on left and right of windshield opening. Set of 6 oval headed screws to attach the windshield garnish to the pillar. On 30-1's this panel goes above the gas tank at the back edge. The lower part of the windshield closes against this. Used on the closed cars to hold the windshield out for fresh air conditioning or closed to seal out the snow. Chrome plated original style with the smooth slot. Unpolished Accessory Swing Arms in stainless steel. You will have to buff them if you want a shinny chrome-like finish. These have actual notches in them so the arms are sure not to slide or move. Not original equipment, but an accessory. Chrome Accessory Swing Arm set. These have actual notches in them so the arms are sure not to slide or move. Not original equipment, but an accessory. These chrome cup shaped washers have a hard rubber insert that sets in them for going against the swing arms to grip better. 1 set does both sides. Made in USA. Windshield Swing Arm Nut for the 1928-31 Model A Ford swing arm. 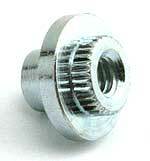 This is the chrome plated nut to hold the swing arm when you open the windshield on closed cars. SOLD EACH. (Two required for a windshield). This spcial nut was swedged into the windshield frame bracket to hold the swing arms. Made in USA. This set is used to hold the swing arms to the windshield frame. 1 kit does both sides. If your windshield brackets do not have the threaded insert, the female nut in this kit will replace it. Windshield Pivot Bolt & Nut set for the 1928-31. The gasket for the bottom and sides of the closed car steel windshield frame. Put the bottom in first, but don't cut it. Wait till the next day to finish the job, as this lets the rubber shrink so the corners will be tight. Length 7 ft.
Also fits 1932-34 pickup cab. 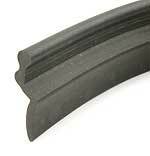 This windshield frame gasket is special for the reproduction aluminium windshield frames. Does both sides and the bottom. This rubber keeps rain from coming in over the top of the windshield and fits between windshield hinge and body. Length 4 ft. The hinge and frame gasket used on the slant windshield cars was slightly different than what was used on earlier A's. This kit will give you both the hinge and frame rubber. Made in USA. Closed car windshield frame made of aluminium. Close duplicates of originals! Come complete with frame gasket, and the mounting hinge. Fits the 1928-29 Tudor, Coupe, Sport Coupe, Closed Cab Trucks and most 4-doors. 1928-29 Windshield Frame, all steel as original. This is the frame only. Hinge is NOT included. Fits Coupe, Tudor, Straight Windshield Cabriolet, Pickup and 30-1 staraight windshield 4-doors. Closed car windshield frame made of aluminium. Close duplicates of originals! Come complete with frame gasket, and the mounting hinge. Fits the 1930-31 Tudor, Coupe, Sport Coupe, Closed Cab Trucks and most 4-doors. 1928-31 Windshield Frame, all steel as original. This is the frame only. Hinge included. Fits Coupe, Tudor, Straight Windshield Cabriolet, Pickup and 30-1 staraight windshield 4-doors. 1931 Windshield Frame, all steel as original. This is the frame only. Fits slant windshield 4-doors. Closed car windshield frame made of aluminium. Close duplicates of originals! Come complete with frame gasket, and the mounting hinge. Fits the 1931 Victoria and Slant Windshield 4-doors. Closed car windshield frame made of aluminium. Close duplicates of originals! Come complete with frame gasket, and the mounting hinge. Fits the 1932 Truck.